Earlier this week, I attended Workday Rising 2017 in Chicago, along with 8,500 customers, prospects, partners and industry influencers. 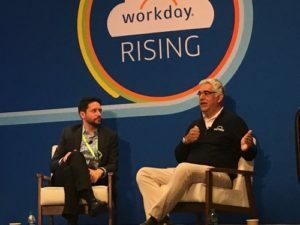 While there is little doubt that its HCM and Financial Management apps continue to drive the vast majority of its top-line revenue growth, Workday used Rising as a forum to emphasize its continuing commitment to innovate, which is now squarely focused around its growing analytics and platform capabilities. Prism Analytics and the Rise of Workday’s Data Strategy. I had a chance to talk informally with more than twenty current customers (along with a handful of prospects), and across the board the feedback around the launch of Prism Analytics and its Data-a-as-Service initiative was very positive. Built on the backs of its acquisition of Platfora in 2016, the fully rewritten Prism Analytics provides powerful data integration / self-service data discovery / analytic engagement that can be used against both Workday and non-Workday data alike. While Workday will no doubt continue to be known as a next-gen apps player, the launch of Prism Analytics combined with its investments in Benchmarking, Planning and Worksheets, are clear signposts of Workday’s “data” diversification strategy. Frankly, I think this is very smart, as it will not only provide value to existing customers, but will likewise help open doors to a range of new buyers – especially in the Office of the CFO – who otherwise might not yet be ready to commit to a core financials application overhaul. More on that below. 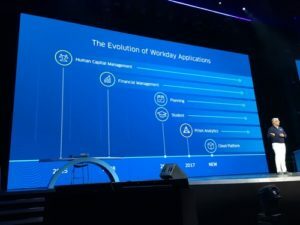 As CEO Aneel Bhusri emphasized in his keynote, Workday is evolving to become an important “System of Insight” (and in support of what Mike McNamara, CEO of Flex termed in his Weds AM keynote, the “Age of Intelligence” – see Vinnie Mirchandani’s excellent post for more on that). In support of this theme, throughout the conference Workday’s presentations were littered with the mantra of “Plan, Executive, Analyze” – new messaging that the brand will get behind that helps frame the scope and breadth of its evolving vision. Cloud Platform – The Next Chapter. Combined with its investments in analytics, Bhusri shared further that, “Cloud Platform is a new chapter for Workday.” After a soft launch with Partners earlier in the year, Workday is now delivering a set of API-driven Platform-as-a-Service (PaaS) capabilities targeted to both customers wanting to extend their current application footprint, as well as SI Partners and ISVs looking to develop unique solutions at either the industry or business process level. We see this as an important competitive catch-up move, as SAP and Oracle can no longer use their rich PaaS toolsets as a unique competitive threat. In fact, this may help accelerate some large enterprise accounts to abandon their (often frozen-in-time) 20+ year-old legacy deployments now that they can have their cake and eat it too (in terms of off-the-shelf Cloud apps plus custom development capabilities from Workday). Ten Year Retrospective. At Rising, I had the pleasure of catching up with Brian Sommers of TechVentive, who reminded me that he had seen me speak years ago at a Workday event in Chicago at the Intercontinental. After thinking about it, I realized it had been during Workday’s initial kick-off briefing tour in the late Spring 2007, when Workday first went to market. It was a lot of fun traveling on the five-city tour with Co-founders Dave Duffield and Aneel Bhusri, Deb Wolf (former VP of Marketing) and the rest of the Workday team as they unveiled their innovative new offering. Customer Satisfaction. But what was true then is even more true today. 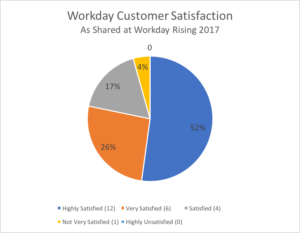 I walked away from Rising this year with a firm sense of continued strong momentum for Workday based on two simple questions asked of the 23 customers I spoke with. The first question focused on how “Satisfied” they were with their investments in Workday. The second question focused on whether they would be investing more or less with Workday in 2018. In regard to the first question, I asked them to rank their level of satisfaction, with a “5” being Highly Satisfied, “3” being Satisfied, and a “1” being Highly Unsatisfied. As the chart illustrates, 96 percent rated their relationship “Satisfied” or better (52 percent “Highly Satisfied”) – with the biggest complaints being: 1) an inability to keep up with the pace of innovation, and 2) growing “skills” challenges, especially around getting the attention of both Workday and 3rd party consultants for routine project work. In regard to the 2nd question, 60 percent indicated that they would be spending more money with Workday in 2018 than in 2017, 36 percent roughly the same, with only 1 individual indicating that spending would be down moderately. I found the 170+ Planning customer count especially impressive, since the offering was only launched a year ago. At the 2017 Tech Summit that I attended in mid-May, the customer count had reached 110 – so it appears that demand is accelerating quickly. It was noted by Betsy Bland, VP Product Management, that 75 percent or more of demand has been driven around Financial Planning use cases, but they have been pleasantly surprised by its use for Workforce Planning and other non-financial use cases. AWS and the Public Cloud. While I was surprised that a Public Cloud roadmap was not formally announced at the conference, Workday made clear that they are very committed to a Public Cloud option for their customers, and continue to invest to support the AWS platform. In the Wednesday morning Executive Q&A session with Industry Analysts and Influencers, it was made clear by Bhusri and David Clarke (SVP Technology Development) that “we are at least a year away from offering AWS . . . By the middle of 2018, we will have our 1st set of customers live in Canada [where it is being tested] . . . . However, for the next 5-7 years we will primarily be using our own Cloud.” At the same time, Workday shared that it would be increasingly taking advantage of cutting edge features on AWS that they would have a hard time matching internally – implying that eventually (in a 5-7-year timeframe) a majority of the Workday workload may reside in the Public Cloud.